“The students and centers really need to work according to Rinpoche’s wishes. Whatever Rinpoche has advised for the them to do, it’s important to follow Rinpoche’s advice. The main thing is that everyone in the organization should really strive to fulfill Rinpoche’s advice. In order to be harmonious, generally, you should not look for any faults in others, but look for the positive, the inner qualities. Thinking negatively like, “He is bad, she is bad”, will not lead to harmony. Try to see the qualities in others and try to work harmoniously. Recite the prayer Losang gyal tan ma – The Prayer for the Flourishing of Je Tsongkhapa’s Teachings – well [for links to the prayer see below]. Please recite it well. If students can do that, that’s really great. But the most important thing is not looking at each others’ faults but looking at the qualities of others. This prayer is also in Essential Buddhist Prayers, an FPMT Prayer Book, Volume 1. Rinpoche’s condition has been steadily improving. Recently Rinpoche’s brother Sangay offered Rinpoche an exercise bike. Rinpoche rides nearly every day 3 kms. I am hoping soon we can increase that to 5 kms. The right leg now is quite strong, the right arm still needs more effort to increase its functionality. Rinpoche’s writing has improved and he can write short notes quite well. The doctors are comfortable with Rinpoche’s control of blood pressure and sugar levels, still not ideal but for Rinpoche’s present condition they feel quite ok.
Rinpoche is in retreat for a short time before the Kalachakra initiation. I just mentioned to Rinpoche that some students have between them recited the Golden Light Sutra more than 100 times. Rinpoche was very pleased. As he sat down to start a session, Rinpoche said “so beneficial for those who recited … amazing amazing benefits, can’t imagine! … from my heart THANK YOU TO EVERYONE”. On Dec 16th there is a special long life puja being offered to Rinpoche by some of the high lamas here in Dharamsala, this is done over 3 days. PS from Claire: thanks again to all who recited the Golden Light Sutra as requested on Dec 7th. As we have accumulated more than 88 recitations between us, no need to let me know any further recitations. Thank you and big rejoicing! For Rinpoche’s health and long life, we have been advised it is very important for students to accumulate 88 recitations of the Golden Light Sutra. There is no deadline but it would be helpful and very good to get these recitations completed soon. We have made the Sutra of Golden Light available in various languages to read/download. Please would centers, projects, services and individual students email me when you have completed any recitations, and I will keep a tally. Rinpoche has been in France and now India focusing on his health. With the help of Khandro la Rinpoche continues to improve. Everyone has been very understanding in giving Rinpoche the space for the necessary therapy. Rinpoche is being careful to follow a good diet and doing regular exercise (with some prompting). Rinpoche is continuing with his western medication, in addition he is seeing a Tibetan doctor who is giving Tibetan medicine for paralysis. Rinpoche is also regularly going to a hot spring and having Tibetan treatment called “LUM” … simply speaking is a special mixture of herbs in a hot bath. One exercise that Rinpoche enjoys …which surprised us all is … soccer! Kicking around a little ball … it is good exercise and helps with balance and coordination … Rinpoche gets a real kick out of this! All the treatment outside of the western medical is guided by Khandro la. And Khandro la fully supports the western medical approach. Thank you to everyone for all your support in so many ways, very much appreciated! Rinpoche’s treatment continues here in France. The flight from Nepal was smooth, it took some days of rest after the flight to recover. The treatment is going well, especially with Khandro la’s assistance. We are hoping with 4 weeks of concentrated therapy Rinpoche will make some good improvement. The main focus is on the right arm and right leg. While in Kopan Rinpoche did give some teachings to the monks and nuns. Rinpoche kept the teachings brief (for Rinpoche) … about 2 hours and this worked well, if it was longer Rinpoche’s speech started to get tired. Thank you to everyone for all your support in many different ways, greatly appreciated. Rejoice! 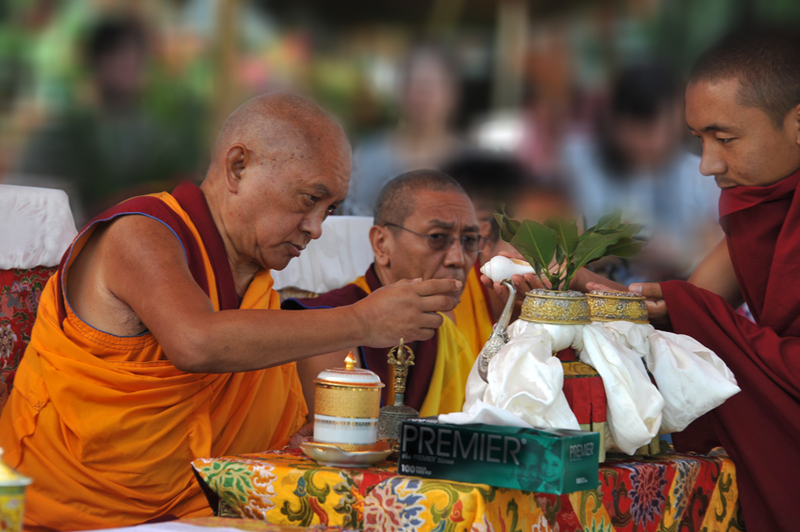 From his own side, Yang Teng Tulku has composed a prayer – Panacea of Pure Nectar – to offer to Lama Zopa Rinpoche. Yang Teng Tulku is a very knowledgeable young lama working in His Holiness the Dalai Lama’s Private Office assisting with Dharma texts and so on. Lama Zopa Rinpoche said that this prayer can be made available for students if they would like to read and recite it. NB: this should not be confused with the long life prayer for Lama Zopa Rinpoche. Rinpoche continues to progress steadily here in Nepal. Rinpoche’s doctors have advised to now increase the medication for blood pressure which was started today. The blood pressure has been much better than prior to the stoke but now the doctors aim to bring it 130/80 range. Rinpoche’s sugar levels have also been much better and we will continue with Rinpoche taking insulin but the type of insulin is changing in order to have better control. Movement of the right leg and right arm is a little better. The speech also is getting a little better. 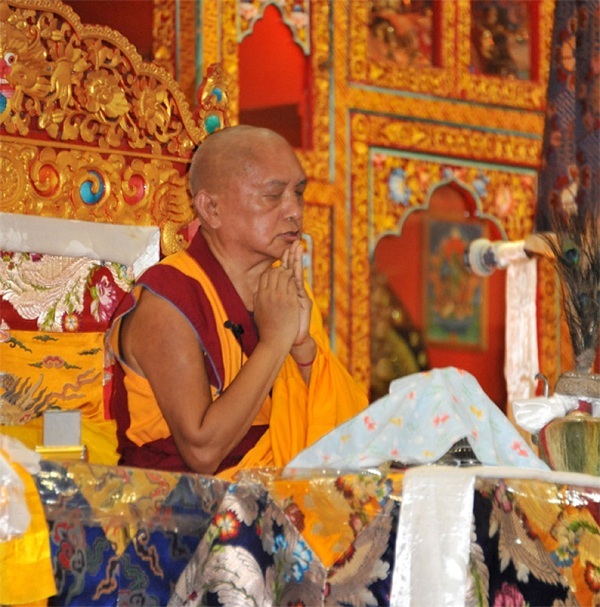 Rinpoche is continuing the chanting of Chod in particular (also other prayers out loud) for exercising the speech. Depending on the weather … we get a lot of rain , Rinpoche does kora 3 or 4 times a week around Bouddhanath and Swayambunath stupa (alternating). Sometimes it’s in the rain. Swayambunath kora at the base is 3 kms. Rinpoche walks the whole way. At Bouddhanath Rinpoche does 4 circumambulations walking and then another 6 in the wheel chair. This is one exercise Rinpoche really enjoys. We usually do it late at night, no one else is around so it is really a nice and peaceful time. If we get to the stupa early enough we go to “Flavors” for tea , great “little” place where some of the waiters and waitresses are small people … not more than 3 feet high. Sincere thanks to everyone for all your support in so many ways. Some recent short video clips showing Lama Zopa Rinpoche’s progress 4 months since the stroke. 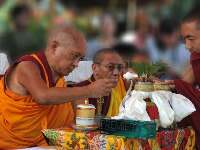 The videos show Rinpoche walking and using his right hand to eat and write. Now it is nearly 4 months since Rinpoche had a stroke, we are doing our best in changing circumstances to keep the discipline of physio and physical exercises going as well as medication for the control of the diabetes and blood pressure. In terms of Rinpoche’s progress it is slow but continues to be positive. There is more use of the right arm and leg, the arm is taking longer but according to doctors this is expected. 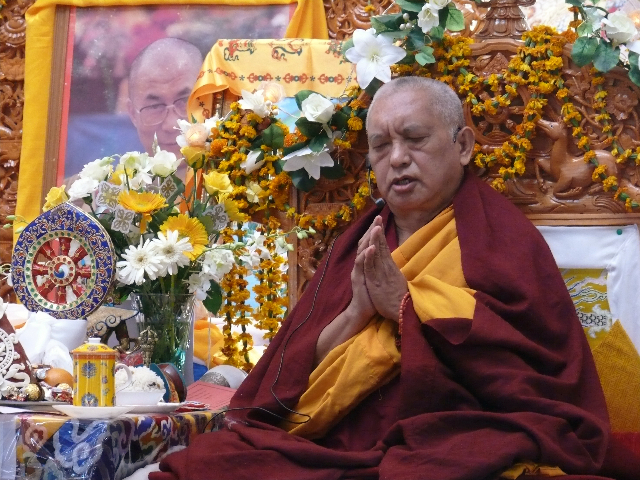 The speech seems to be improving slowly also and Rinpoche uses chanting prayers as the exercise for the mouth rather than what the speech therapist normally gives. The difficult and complicated chanting takes quite a bit of effort but seems to be working … and of course much more inspiring (to Rinpoche) than the normal phrases. We have had a new leg brace made which allows Rinpoche better leg movement when walking, so now we use part of the high quality brace made in Australia (A$2,000) with the brace made here (3,200 rs … about $35 dollars) and it seems we have a good arrangement for the next phase of development in helping the right leg. The right arm and hand is more complicated and depends a lot on Rinpoche using it as much as he can … to retrain it, so if you get something signed by Rinpoche and you can’t read it… then you know it has been signed by Rinpoche.